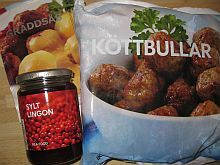 Thanks to (our neighbor) the local IKEA we are going Swedish today. It sure looks tasty. 15.000 colored coins. This was the eventual number of the orange colored lucky dime. A dime that really wasn’t very lucky if you look at the recent results of the Dutch football team. During this sale of colored coins the Dutch Royal Mint invalidated/destroyed coins with a total value of 1.500 Euros. These 1.500 Euros they colored, packaged and sold for (1.500 x 4.95 = ) 75.250 Euros. A nice profit. Now we wait. We wait to see that the next release by the Dutch Royal Mint will be. Will they continue with coloring parts of the coins they release or will they finally realize that colored coins are still a gray area in regard to the law and when considering coin collectors. When we were in Holland we had another highlight. Alex remained standing with just a little bit of help. An impressive feat for a little boy of just 10 months. Why does this photo remind me so much of the little prince? During our visit to the Netherlands we spend a couple of days at my brothers place. He had just bought a nice new car, an Audi A3. He had the car for only a couple of weeks, and it is usually parked right in front of his door in a quiet residential area in the Hague. Everything seemed okay, but something very unexpected happened. One morning we suddenly encountered a big gaping hole in the door, just below the lock. Ofter filing an online report at the police department and the insurance agency we visited a mechanic and got some very clear information. He hole was clearly made to rob the built in navigation. 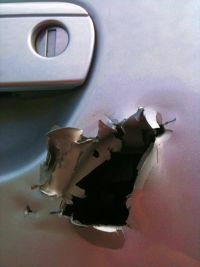 The thieves were interrupted during their work, and left just after making the hole, and before entering the car. The car window was still intact, because breaking the windows triggers the alarm. A big hole in the door is ignored by the alarm system and allowed the thieves to open the door without triggering the alarm.. Taking the car home without repair would imply that the navigation system would for sure be stolen that night. The car was left at the mechanics to repair and reinforce the door, but the previsions are not very good. We also received some unofficial information. The thieves will be back for sure. The door will be reinforces but probably it will not be enough, of the thieves will return with bigger equipment. The navigation system is said to be worth just 10 euros in the south of Europe. I doubt if this is really the price, because a new navigation system costs around 1500 euros. The current solution is a big metal bar connected to the steering wheel, which extends to hover before the navigation system. Hopefully this will deter any thieves. A long time ago I was a very frequent player of computer games. 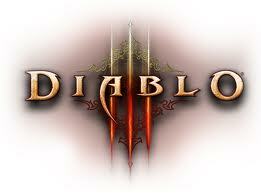 Diablo was one of the games I liked playing and recently a new version of this game was released. A game I just had to try for myself. A free version is available which you can use to try the game. The free version allowed you to play a small part of the actual game, but you can only get access to the free version if you know someone who has bought the game, and who is willing to give you one of his special try-out keys. I was lucky because I knew just such a person. Now for the game. The first thing I noticed is that it resembles the previous version a lot. Really a LOT. Did this really take 8 year to create? My PC did not match the minimum specs but still the game ran surprisingly well. Killing monsters went smooth and easy and I did not run into problems. The old feelings I remember having while playing this game resurfaced. I managed to perfectly kill lots of monsters, but that the game was without problems is not really accurate. The new version of Diablo requires you to be online while playing and you need to be logged into your battle.net account. Not really a problem, except that it fails quite a lot of times. Sometimes you loose your connection in the middle of the game, and all you can do is exit the game and restart it. After the last update I am unable to play at all. To bad. The last issue I have with this game is the price. In the local shops you can buy the boxed version for a little over 40 euros. The digital version is easier to get, without leaving home at the Blizzard site. This digital version is without box and without CD but for some strange reason it is priced at almost 60 euros. A ridiculous difference. My conclusion: It is a nice game, but for now I´ll stick to the demo version even though I finished this small part of the game already a few times. We enjoyed some nice holidays. Three weeks that we spend in the Nertherlands and in Spain. We enjoyed ourselfs and Alex also had a good time. After three weeks he suddenly had three more teeth. He is now crawling, plays with his parents and suddenly had a very big mouth.